Polynesians - SFSU - Class of 2005. The Pacific Islanders Club was established in 1995 at the San Francisco State University. It was a pleasure to attend the Graduation Ceremony - 8 students gathered at the Jack Adams Hall on Saturday, May 14, 2005. There to support them the members of the Pacific Islanders Club (PIC) and family and friends. David A. Abella, Theresa Tolentino Atienza, Lynn Sarah Kahalekai Avalos, Myra Halaevalu Te'o Feliciano, Racquel Anna Guidry-Ismael and Trini Setoga all graduated with Bachelor of Arts Degrees. Andrew Liualii Gabriel and Allen Rey O. Gopez with Bachelor of Science Degrees. The key note speak was David Taumoepeau who once worked for a major Wall Street Firm, started in own dot.com company and now teaches music to young children - ages 5 to 13 years. He left it all after his father passed away and his mother felt ill. He makes less money now but gets a lot of happiness doing what he loves doing best. He also serves on several Commissions and is the President of the Board for Pacific Islander Association of California. He is happy near to his mother. David studied classical piano and graduated with a degree in Political Science - University of California, Los Angeles (UCLA). Audrey Allen-Nauer was the Mistress of Ceremonies and did a wonderful job. She also helped organize the event and had the Adams Hall tastefully decorated. The food was good and the music great. Most of all it was a family atmosphere and a far cry from the graduation ceremonies where hundreds congregate and everything is done is so mechanical a manner. Audrey kept everyone happy clowning and cracking jokes at every opportunity she got. Kudos. Each of the graduates was given an opportunity to speak. The men came forward and each gave a small speech. Each speech was from the heart and I saw many wiping the tears from their eyes. It was interesting to note that the common denominator was hard work and perseverance. 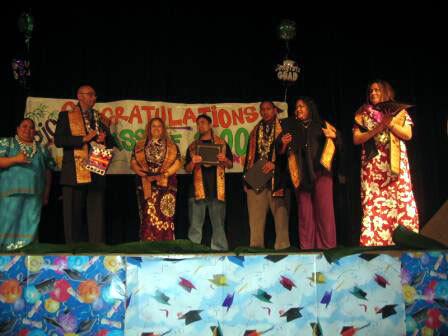 Mostly all of them were proud to be the first ones who had graduated in their families and now had to be role models for Pacific Islanders in the Bay Area and else where. It is not easy in today's world for most Pacific Islander youth and especially the boys to go astray. Crime, drugs, and the allure of fast money and fake dreams - have taken a heavy toll of our Pacific Islander youth. I see them in every day life but more in institutions where they are incarcerated. Perhaps the person who really explained this fact was Andrew Liualii Gabriel. He could have easily taken the path of crime and drugs and landed in jail. His parents and his fiancé Jamie Ma'o and little daughter Jenaly Anrea Gabriel - he said " keeps it real for me and always gives me the love and support I need each and every day". John Nauer who is our All Islanders Gathering As One (AIGA1) President accompanied me. I had some time before the ceremonies started to browse through the various bios and asked John to read to me the bio of Racquel Anna Guidry Ismael. He did and I got a flavor of what at least one graduate felt about this great day. She was the first to graduate from both sides of her family. I had forgotten my glasses so John did me a favor since the print was too small and straining my eyes is not what I am good at. Almost everyone in the audience cried when Lynn Sarah Kahalekai Avalos dedicated her degree to her sister. She had a good word for everyone including Cummings Nauer for the long talks, companionship, rides to places and introducing her to so many friends through the Pacific Islanders Club (PIC). David Abella has proved himself very capable and has held various leadership roles at the State University. He told the audience he could make a long speech but chose to make a short one. So did All Gopez referring to his bio that was the shortest. A graduate of Biochemistry this man has his eyes on the goal. His advice " keep your head up and be strong". " I am done with" said Theresa Tolentino Atienza and gracefully took her place on the stage - after her short speech. I know that lady is going places and wish her luck. Even on her day of graduation Myra Halaevalu Te'o Feliciano had to work. I admire anyone who is so dedicated. Her goal " is to be a mother and raise my children so that they know their true Samoan heritage along with her husband's culture as well". She mentioned in Samoan that she was headstrong. I had to ask John Nauer what she said and admire this lady for her hard work and genuine sincerity. The PIC dancers did a wonderful job taking us to Hawaii, Tahiti, Samoa, New Zealand, and a few other Polynesian Islands. The food was sumptuous and tasty. And may I had one could go for seconds and more. The tender pork was a favorite of many and for desert there was lots of cake. The key note speaker gave a good speech and again spoke about his own life experience. David Taumoepeau has a lot to be proud of and a role model not only for all Polynesian youth but youth in general. Certificates were presented to all the graduates and the keynote speaker himself was given a certificate for his excellence as a seasoned graduate and leader in the Polynesian community. Audrey and Cummings mother Mrs. Aimalae Nauer has always been a great source of encouragement behind the scenes. Often times she will go out of her way to treat all youth and the Polynesian community with love. The few times I have met Mrs. Aimalae Nauer she has shared with me words of wisdom. It has been my pleasure to work with Audrey and Sam her husband, Cummings and of course John Nauer my good friend. Mrs. Aimalae Nauer hand stitched a sash for each graduate. I taught this was a great gesture and the fabric and pattern she chose very tradition. If I am not mistaken she has done this in previous years too. 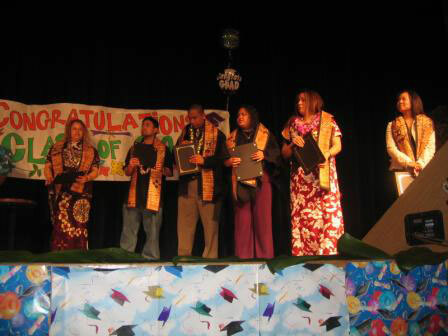 I saw the graduates wear the sashes with Polynesian Pride. I represent the Muwekma Ohlone the first people of the Bay Area. It has been my focus to fight for the rights of the First People. All Polynesians share the goodness of being indigenous and in touch with the elements of the Earth. The Wind, the Water, the Fire, and the Land. Plants, Fish, Birds, Butterflies, Frogs, Animals and all beings living on this Earth. From the Great Sky the Sun and the Moon and all the Planets have seen it all. And beyond this Earth the Universe has been good to those that are down to Earth and more Respect the Earth. All Polynesians have an inherent goodness but a lot of it is lost in any materialist setting. That is why it was nice to hear that soul from each graduate express itself so sincerely - there was nothing fake that one hears and see elsewhere at other graduating ceremonies. I want to thank everyone for sharing and I am sorry that I forgot to take my camera. I always love photographs - they say so much. I was promised by some one to send me just one photograph - but this has not materialized. I look forward working with Pacific Islanders Club even as I work hard for All Islanders Gathering As One. Keep up the good work and let the world know that Polynesians are a force to be reckoned with and should contribute their talents in every field. Sharing the Talofa and the Aloha.